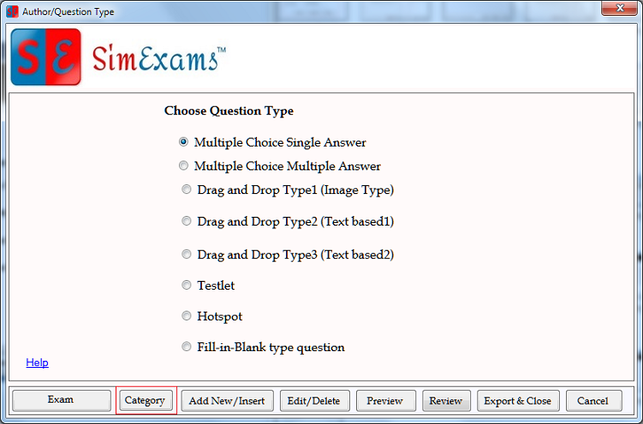 Add/Edit Categories : This feature is used to enter various categories (topics) covered in exam. Each question entered in database must belong to one category (topic). Before Author can start entering questions in the database new categories (topics) must be entered. Each exam must have at least one category (topic). To Add/Edit the category (topic) click on the "Category" button in "Author/Question Type" screen. 1. Add new Category: To add a new category enter the category name under "New Category" section and Click on "Add" button. 2. 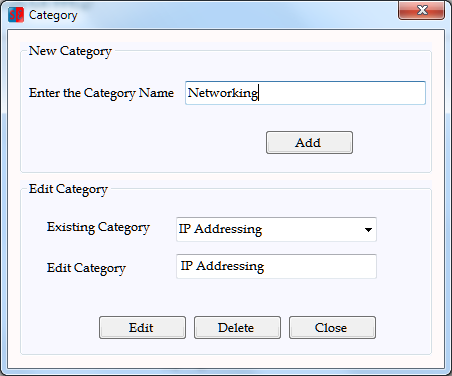 Edit an existing category: List of all the existing categories is provided under "Edit Category" section, select the category you want to edit from "Existing Category" list, then enter the edited name in "Edit Category" field and click "Edit".